Peak Oil Debunked: 99. HOW FAST CAN WE MINE COAL? The reserve/production (R/P) ratio is often used as a shorthand way of indicating how long current reserves will last at current production rates. The peak oilers often criticize this ratio (and rightfully so) because it fails to take growth into account. For example, at present the U.S. has about 270,000 million short tons (MMst) of coal, and a production rate of about 1,000MMst per year. Dividing, we obtain an R/P ratio of about 270. This is where the sound bite "we have more than 200 years of coal left" comes from. It's true that this neglects the effects of growth in demand, but it also neglects the effects of growth in reserves (which occurs as previously uneconomical deposits become exploitable due to higher prices and improved technology). The R/P ratio definitely has defects as an indicator of how long a reserve will last, but it is useful for reducing a large reserve number to a human scale. It's a lot more comprehensible to the layman to say "we have 270 years of coal left at current mining rates" than to say "we have 270 billion short tons of coal reserves". In that sense, the R/P ratio is useful. That said, let's take a different tangent. Let's look at the reciprocal of the R/P ratio -- i.e. the P/R ratio. This ratio is interesting because it gives an indication of how fast coal can be mined. 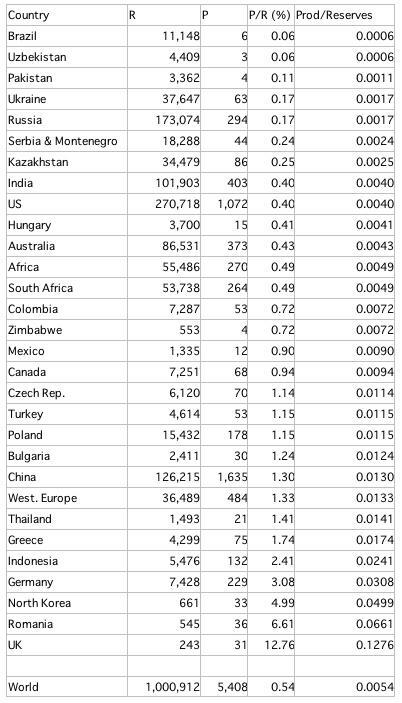 Granted this is a rough estimate, but it seems reasonable to conjecture that the maximum speed at which a country can mine coal (in MMst per year) is a function of the size of that country's reserves. 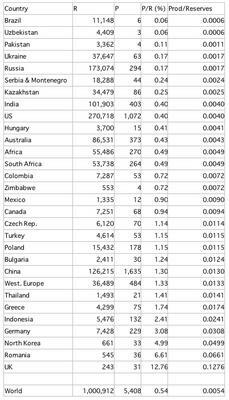 The following Table gives the P/R ratios for all countries which are significant players in coal mining. Reserve figures are recoverable reserves as of 2002 from the DOE's Annual Energy Review 2004 (P. 323). Production figures are from 2003, obtained from the same Annual Energy Review (P. 325), and the DOE international coal production spreadsheet located here(excel file). Reserve figures are given in MMst, and production figures are given in MMst/year. Click on the Table for a clearer view. Some countries, like Brazil, Pakistan and Russia, have substantial coal reserves which they are exploiting at a very low speed. In terms of R/P ratio, Brazil's reserves will last for about 2,000 years at the current rate, and Russia's massive deposits will last for about 590 years. As noted above, the figure for the U.S. is about 270 years. On the other hand, we have countries which are mining at high speed like the Czech Republic (see #36), China, Germany and the UK -- which have R/P ratios of 87 years, 77 years, 32 years and 8 years, respectively. A common doomer argument is that coal will not be able to save the day because it cannot be mined fast enough, but these numbers give us a rough indication of how fast coal can be mined. For example, the U.S. currently mines 1,072MMst/year. If the U.S. were to mine coal at a rate comparable to that of China (the world's largest coal producer), the figures indicate that the U.S. could mine 3,507MMst per year, or roughly 3 times what it is mining now. That's a lot of coal. In fact, on a btu basis, it is almost enough to replace all primary energy currently provided by oil and natural gas. On the other hand, if all of that coal were liquefied at the usual thermal efficiency of 65% (see the coal liquefaction energy flow diagram in #94), it would be equivalent to about 22 million barrels per day of liquid fuel -- i.e. roughly the amount of oil which the U.S. consumes today. The situation can be furthered improved if the U.S. adopts a nuclear electricity strategy like that of France (see #42). If nuclear generators are installed to eliminate coal generators, natural gas can be substituted with coal gas, and oil can be substituted with coal liquefaction (see #43). In this way, the entire economy can run on nuclear power and coal. Oh yeah, there is no problem JD, thankyou I will begin resuming eating my bigmacs everyday and driving a large car which I fill up with stones so I use more fuel to help the economey. Thankyou for telling mr joesixpack that everything is fine and dandy and there is not a cloud in the sky. How could we be so stupid! we started with coal 150 years ago to use as heating, then we used oil to drive our cars. It excapes me why we ever bothered with oil when we have so much coal that we could have turned into oil for cars? You know joe sixpack is dumbfounded, he thought we where running out of oil and he sold his pickup truck, why didn't YOU tell him he could get his oil from coal before? Joe ain't that smart but if it only cost $40 barrel to get oil from coal, why isn't he being fed this now? Why does poor mr joe have to say nay to a supersize meal now, Can you answer that JD? Joe wants to know. "Oh yeah, there is no problem JD, thankyou I will begin resuming eating my bigmacs everyday"
This is not a call for business as usual, it is a proposal for mitigation of declining crude oil supplies. "... and driving a large car which I fill up with stones so I use more fuel to help the economey." Are you joking? Coal will not be used whole in cars, coal will be liquified to synthetic oil. South Africa has done this for years, as shown in a previous post recently. "It excapes me why we ever bothered with oil when we have so much coal that we could have turned into oil for cars?" "Joe ain't that smart but if it only cost $40 barrel to get oil from coal, why isn't he being fed this now?" It was super cheap to extract and use verus coal back in the early days, but as you point out in rambling rant, the proce of crude oil has crossed the point where coal liquefaction has become economically competitive with oil. "Why does poor mr joe have to say nay to a supersize meal now, Can you answer that JD? Joe wants to know." Your contempt for the common man throughout this post comes off as morally superior and elitist. If you really want to help these people, how will acting like this help things in any significant way? Coal liquefaction should be reserved to mitigate an overnight collapse in production. It releases huge amount of CO2 in the atmosphere in spite of what its proponents say. The statement that we have 270 years of coal at current mining rates is accurate, but it is also disingenuous. We will not mine at the current rate going forward into the future, we will increase the rate as our dependence on coal increases. That coal reserve will not last 270 years. If we increased our dependence on coal by 3% a year from now until we run out of coal, we have roughly 35 years of coal reserves. Not a whole lot is it? dukat: Nowhere does JD say we can go on with business as usual - he's saying we don't have to curl up and die. "Business as usual" is totally your invention. Your strawman attacks (and your elitism) make you sound simply desperate to preserve your system of thought. However, the last anon is right that JD didn't factor in demand growth. I'm sure, however, that he would say we need to stop growing. An admirable goal, but easier said than done. Above posters pretty much said it all. JD, how you can demonstrate such a an ability to do research but still be so stunningly stupid is really amazing. "Above posters pretty much said it all. JD, how you can demonstrate such a an ability to do research but still be so stunningly stupid is really amazing." I think you forgot the nuclear power part of the equation, Anon (was is your handle anyway? We won't bite :P ). Combinh nuclear with coal means coal stores will last longer than one of the other anon posters had said. It also does not take into account imports, making domestic stocks last even longer. We should increase our coal mining and production rate and begin turning our reserves into oil. If we last 35 years, that is more than enough time. We could simply use 1 years worth of our reserves and completely stop importing foreign oil all together for a year. That would cripple the oil market and OPEC would shrivel up and die. Then, after that year, we could resume importing oil (if we wanted to) for a much cheaper price. "If the U.S. were to mine coal at a rate comparable to that of China (the world's largest coal producer), the figures indicate that the U.S. could mine 3,507MMst per year, or roughly 3 times what it is mining now." Terrible argument. You may as well say "Well, the world is mining 7 thousand million tons per year, so that means the US could do the same." *buzzer* Wrong. Extraction depends heavily on resource concentration. If there's only one deposit, but it's huge, it'll be easier to extract those resources than if the same quantity of resources is spread all over the place in tiny portions. Is it easier to drink water from a cup, or to sip it out of a cloud?